This news to me. No-one at Nature thought to tell me, or anything. Their system said nothing about when I logged in, nor when I started entering my comment. Just waited till I’d finished, then trashed it. I have no idea why I am banned. How can I have, when I’ve never received any notification? I can only assume it’s for posting opinions that are at odds with what NPG would prefer we all thought — at least, in the absence of any actual data, that’s the best hypothesis I can come up with. Update 40 minutes later: turns out it was a glitch in the spam-filter. Richard got it fixed, and my comment is now up on the article. Anyway: I am paranoid enough that I copied my comment before submitting it — I’ve been screwed in too many ways by too many commenting systems to trust anything but my own. So here is that comment, stripped of its context but still IMHO important. 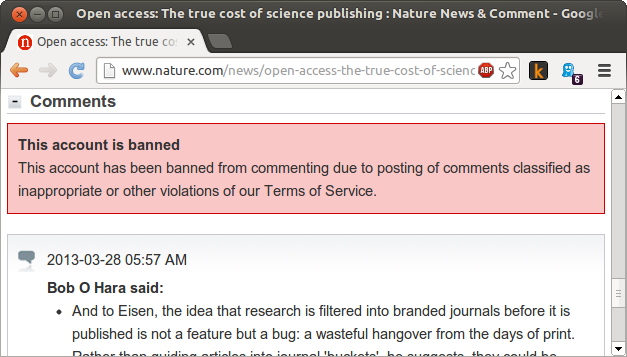 Perhaps someone who has not been banned from commenting at Nature could post it for me? Where do such low numbers come from? As is by now well known, the profit margins for the Big Four publishers (Elsevier, Springer, Wiley and Informa) are between 32.4 and 42 percent — not one of them has a margin as low as the highest end of the range you cite. Not only that, but commercial academic publishers’ profit margins continue to rise year on year. The average profit margin among the Big Four is 36%, which means that of the $9.4 billion spent on subscriptions in 2011, $3.39 billion was simply poured down the academic drain. Note that this profit alone would be enough to pay APCs for 2.5 million PLOS ONE articles, 40% more than the world actually produced in that year. So to spell it out, subscription profits alone would be enough to fund OA publication of ALL research, with just under a billion dollars left over to fund additional research. It’s not just idiotic that we keep paying this ludicrously inflated subscriptions, it’s iniquitous. I have also been banned from commenting on articles. I suspect there is some rather over-zealous autoblocker. thanks Mike — Nature’s commenting system is besieged by gremlins, and routinely screws up. I think that the spam filter automatically bans first-time commenters who make comments with links in them (because we get hundreds of spam comments each day). Comment now retrieved from spam bin and you should be un-banned. Thanks for your quick work, Richard. I’ve tweaked this post accordingly. If you use Firefox, you should download the Lazarus: Form Recovery extension. Automatically tracks whatever you type into a form field, so if an error occurs, you just right click and select “recover text” and it’s back. Nice. But how pathetic that we live in a world where such a thing is necessary. My WordPress account sometimes eats my posts when I try to save a first draft. I’ve been close to tears before realizing that WP caches the big text field (or something), so the back button usually recovers everything before the error. Lazarus sounds like a great extension if it doesn’t use up too much of the system resources or have a Google-ish database of users’ form entries. Luckily, most web content that I type outside of WP is <140 characters, so even my poor memory can bring it back in some zombified form! As always – a thought-provoking post, and I thoroughly enjoyed the in-text edits.